Get your beauty rest with Sleep It Off™, our 21-day at-home skin transformation sleeping mask. Wake up feeling fresh and look more youthful everyday with this natural Retinol Alternative, Blue Green Algae Extract formula. A safe, yet effective way to shed your skin of unwanted conditions such as rough texture, loss of elasticity, dark spots and fine lines/wrinkles without any of the side effects in only 3 weeks! 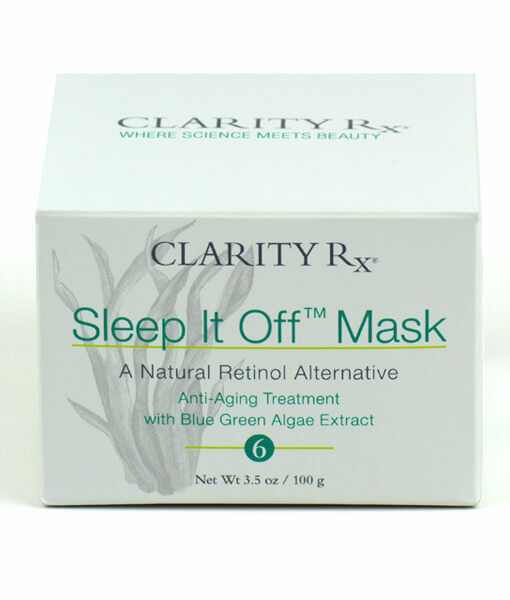 Sleep It Off™ Mask is a progressive, 2-phase anti-aging treatment that goes from a warming nighttime transforming mask to a nourishing moisturizer all in one while your sleep! It also contains a powerful combination of B Vitamins, Amino Acids, and Ginger & Orange Extracts. The results? A smoother, firmer, brighter, clearer complexion. 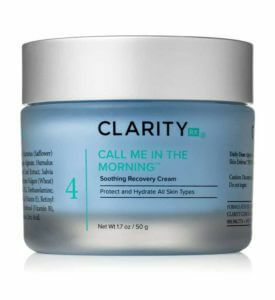 Sleep It Off™ is a progressive and unique, 2-phase anti-aging treatment that goes from a warming nighttime transforming mask to a nourishing moisturizer all in one while you sleep. It also contains a powerful combination Ginger & Orange Extracts and of B Vitamins and Amino Acids. The Results? 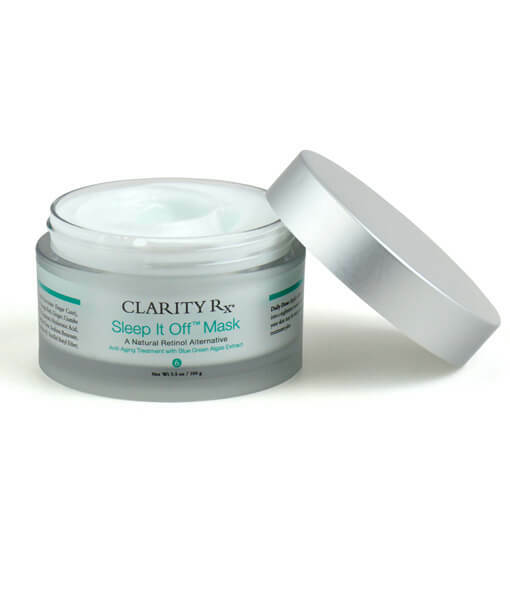 A smoother, firmer, brighter, clearer complexion. Wake up feeling fresh and look more youthful every day! Apply a liberal amount to clean skin every evening for 21 days. 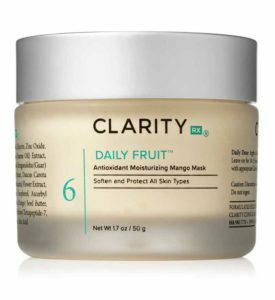 The mask will begin to warm up as it transforms into a nighttime moisturizer. Be sure to apply the ClarityRx® Skin Defense SPF 30 during the day when using this mask as your skin may be more sensitive to UV exposure. It is normal to experience some redness and/or dryness throughout the treatment plan. Purified Water (Aqua), Diheptyl Succinate (Sugar Cane), Capryloyl Glycerin, Algae Extract, Sorbitol, Orange Peel, Ginger, Crambe Abyssinica (Mustard) Seed Oil, Grapeseed Oil, Squalene, Hyaluronic Acid, Caprylic Capric Triglyceride, Glycerin, Xanthan Gum, Sodium Benzoate, Gluconolactone, Calcium Gluconate, Polysorbate 60, Vanillyl Butyl Ether, Phenoxyethanol, Ethylhexylglycerin. 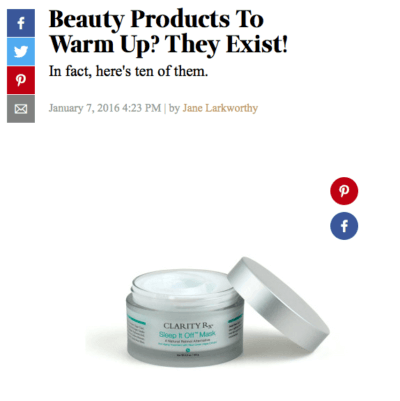 I love this product and have seen great results from it. 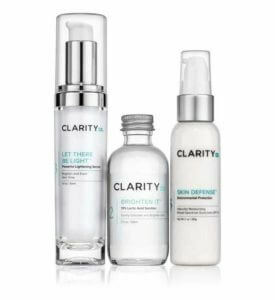 I use almost all safe, natural products and was excited that clarity came out with this. I feel like it noticeably brightens and tightens my skin and has helped even out skin tone. Side note – I have stopped using this while pregnant because my skin was reacting to it, but am excited to go back after my baby is born. Excellent results, love the warming feeling. Love , love my Sleeping off mask , my skin is free off all complexion, definitely must have skin care product .